If the subject of Arsenal’s shareholders is a bit dull to you, then maybe skip this one. Don’t leave some sarky comment afterwards, because I have warned you. If you’d rather just see Spurs fans making fools of themselves in blog comments, go and read this instead. As you probably know, Alisher Usmanov’s Red & White Holdings announced on October 17 that they now had 30% of Arsenal’s shares for the first time. R&W have done most of their buying away from the public gaze of the ISDX market, preferring to write to shareholders individually and offer a no-hassle private transaction. Many small shareholders have taken this offer up. R&W have always said, sometimes quite forcibly, that they have never paid more than £14,000 for a share, despite the market price on ISDX being up to £17,500. It’s settled back a little in recent months, but the last time a share was publicly traded for £14,000 or below was April 2012. Around 200 shares have gone for more than £14,000, so I have always wondered how true the R&W statement was, not to mention their reasons for insisting on telling everyone. As it happens, Arsenal have to submit company returns which include details of shareholdings and how much has been paid for them. (A recent copy has been kindly provided to me by Andrew Fyffe, AKA @PR_WhoRu.) In the return for the period October 12, 2012 to October 17, 2013 it appears that R&W declared that they’d spent $2.14m dollars on shares. They also give the percentage shareholdings at those dates, though these are rounded so you can’t work out exact numbers. However, I know from keeping tabs myself that R&W bought precisely 84 shares during that period. Or at least that’s what they declared, and it would be illegal to declare something untrue. Far be it for any Arsenal shareholder to be mixed up in something illegal. Ahem. $2.14m divided by 84 is $25,476.19, so that’s the average R&W have paid in dollars. 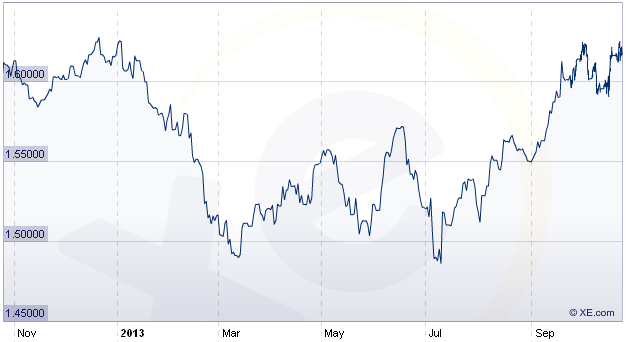 The dollar/pound exchange rate for this period has varied between a high of $1.628 and a low of $1.486. Let’s be on the safe side and take the top figure as the rate for all R&W purchases. That would mean that R&W had paid an average – an average, note – of £15,726 per share. In reality the exchange rate average for the year is around $1.55, in which case R&W would have paid an average of £16,436. Clearly the exact figures depend on the rates when purchases occurred, but it certainly appears that R&W have been paying rather more than £14,000 a share. Does it matter? In the grand scheme of things, not much. But if you’re paying around £16,000 per share, why go round telling everyone something else? It won’t affect the cost of any offer R&W make for Stan Kroenke’s majority holding. If Usmanov was a bit strapped for cash he might want to pretend he’d only pay £14,000 to discourage others from asking more than that, but a) he’s rolling in money, and b) as a tactic it clearly didn’t work anyway. Maybe he just wants to look cleverer than everyone else. It’s just one more thing that looks odd about how Usmanov is conducting his business relating to Arsenal and it looks a bit like he’s not been telling the truth. I wonder why not. Of course I may be completely wrong about all this and R&W have, in some mysterious way, been telling the absolute 100% truth all along. If so I stand to be corrected. As the man with the orthopedic shoes said. ← Spurs Player Gets A Testimonial – And Loses Money! Phil , can you venture a guess as to why R & W holdings are buying shares at all ? With 66% of the shares already owned by Stan Kroenke ( who by all accounts has no intention of selling any of them ) why is Usmanov poking about buying a share here and a share there ? As things stand he cannot take a seat on the board not to mention take control of the club. What’s he up to ? Usmanov always had a target of 30%. He’d got to well over 29% when the Premier League removed most of his motivation for that last year, but carried on towards the target anyway. He then stuck on one share below 30% for 5 months waiting for a moment to announce he’d got to 30%, and for whatever reason decided the day of the AGM was the right day. Where does he go from here? Who knows. As you say all the rest of the cards are held by Kroenke, so I suspect we now have to wait until one of them gets bored before anything changes. That could take a very long time. In the meantime as long as Usmanov stops buying there is at least a small supply left for Fanshare, though ultimately it can’t grow without support from one billionaire or the other. I’ve been struggling to see Usmanov’s endgame and motivation for some time now. I wonder how much of it is not logical, but emotional. Pride, and an unwillingness to acknowledge the current realities. How often does he not get what he wants? While he can afford to pay anything necessary for the shares, it must sting that having bid for the big stock holdings (Lady Nina’s at least), that they seem to have sold to someone else for less. With his current purchases it is a bit of a stretch, but would he want to admit that the only way to acquire shares is to pay more than he planned to and perhaps show his plan failed? Long term of course he’ll make money from his stake-holding, and perhaps at the back of his mind is the idea that eventually he might get Kroenke’s stake, and would want to have well over 90% of the shares at that point, so he could forcibly buy out everyone else. I remain sceptical about the intentions of both of these. One of them will blink, sell to the other and pocket a large profit for their troubles. I just cant help comparing them to the financial doping, enemy of football, Roman Abramovich. By all accounts his total investment over 10 years has been around £1bn. What would Chelsea now be worth? Increased income – breaking even – probably somewhere between £800m and £1bn and rising. So at worst the whole thing has cost him half an Ozil a season and he has presided over 10(?) trophies and had a lot of fun. You will have a better idea than me, but combined investment of Kroenke and Usmanov of around £700m for 97% of Arsenal. What is Arsenal worth? – well with the profits it makes lets say 50% more than Chelsea so between £1.2 and £1.5bn. All very round-sum I know. So whilst Abramovich has spunked his money on players and trophies, K & U have just made a lot of former shareholders astonishingly rich. I know it goes against everything we have believed in but I am worrying more and more that the Arsenal model, good – Chelsea model, bad may not be such a universal truth as I thought. Sorry – that last paragraph is from the fan/football viewpoint. From a business/making a profit viewpoint its bloody marvelous. I’m not sure there’s ever a universal truth. Too many shades of grey. But who’s the whipping boy? We have been fed, year after year from both AW and the board. “Financial doping”, “not fair”, “financial fair play will sort it out and we will be in the perfest position”, “next year”, “planning for the future” etc etc. On various forums last night there were numerous comments from fans about how the loss was not too bad because its only the chavs and they have a rich owner so it doesnt really count. Chelski will be in trouble when he gets bored and leaves. All those years as manager yet we end up having to play Bentner as centre forward. What has happened from the days we put out teams of kids and whipped other premiership teams? “Oh but we’re top of the league”. If we include Spuds and the 2 Liverpool teams we have 12 really tough fixtures a season. We have played one of those so far and that was at home. The 2 Manchester clubs have played 3 and Chelski 4. I really hope its not a false position but I fear it may be. Back to the original point. Rich men are playing with our club for their own ends and it feels terrible being totally unable to do anything about it. Well to an extent rich men have been playing with Arsenal for decades, but the sums involved used to be much smaller and they weren’t making money out of it. Then the major shareholders started to realise they could sell out for big money. The fact that most of them decided to sell to Kroenke means he can do what he likes. Not the ideal situation for supporters.